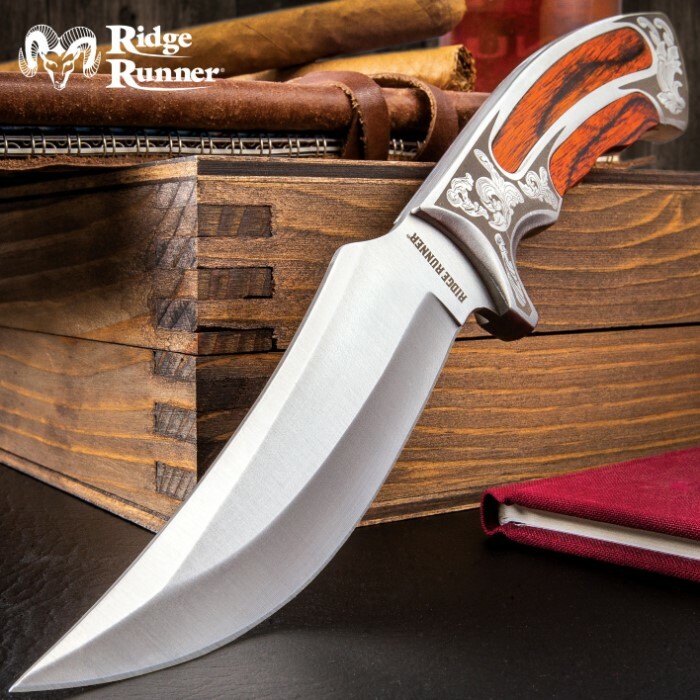 Ridge Runner Executive Wooden Bowie Knife | BUDK.com - Knives & Swords At The Lowest Prices! The Ridge Runner Executive Bowie Knife combines elegance with functionality, offering a custom look and feel at an unbeatable price. The 5" razor-sharp AUS-6 stainless steel blade is full-tang. The custom handle is etched with intricate scrollwork details and has handsome wooden inlays. Our bowie is the right Executive for the job! WOW,BudK,Another Wonderful Value,This Gorgeous Knife is Wonderfully Crafted,Feels Comfortable and Sturdy.Verrry Sharp Straight Out of Package and For the Terrific Price,Much Worth Every Cent. Great knife for the money! I needed a new workhorse fixed blade and while this is not exactly what I'm looking for It's designed and crafted well enough that I'm very happy. I do wish the handle sides were a bit rounder but it's quite comfortable to grip anyway. I've found a few minutes with a Blademedic helped smooth things nicely. Overall geometry is excellent. Blade geometry is well designed for multiple tasks. Nice weight, notched thumb groove, well placed finger grooves. I tried flexing this sucker, hard. 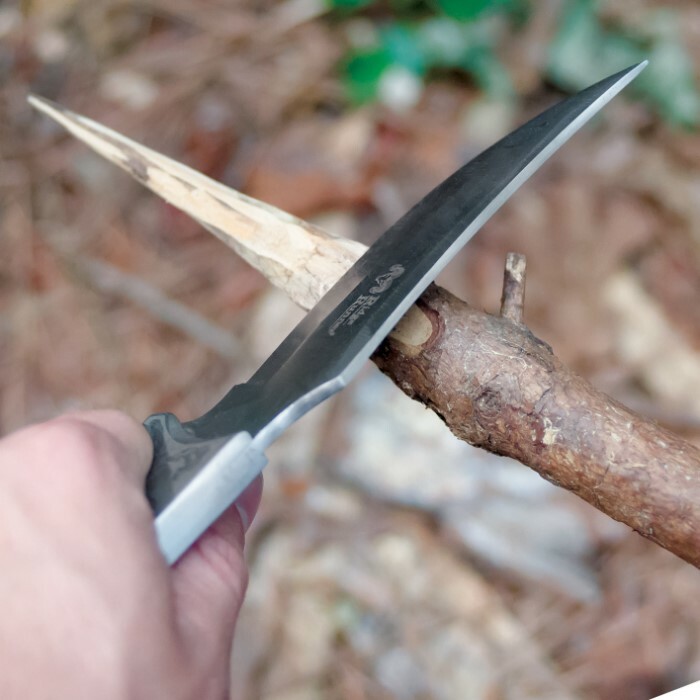 This full tang knife is very strong without felling the least bit brittle. Blade was sharp out of the box with no burrs and was razor sharp in seconds with a Blademedic. Sheath is decent, made of nylon, seems sturdy although it could be a little better fitting for this knife I think. Serviceable for sure. Will make a new leather myself. I'll be back for more with engraving this is a steal at $10. This Knife By Far Had Been Under Estimated & Undermined. This Knife Exudes Elegance @ a Distance . It's Well Crafted and Balance . The Handle is a bit Awkward Since its more Square than Round. But Don't let That deter you. 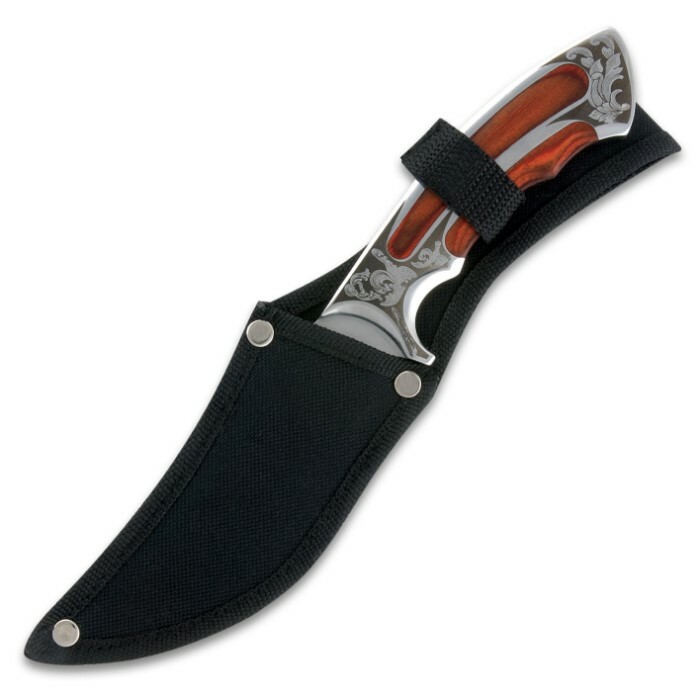 The Clip point and embellished engraving makes this knife stand out. I also had my name engraved on it plus I added a design provide By BUDK (The Crunged Flag they have 14 designs to choose from See BUDK Video on YouTube on Engraving). So That's why I call my knife the tattooed one. Will Make bikers compete & jealous about this knife tattoos. Also. This Knife Has Some Weight to it. You will Debate to use it Because it will perform for you want It's meant to do or Just Keep it in a Glass Display not to scratch it. Either one you Choose is a Win , Win Situation & Really At This Price is a crying shame not to get. It. Makes you're Collection. The Envy of Many. VERY well made knife for the $. $10 are you serious? It's worth 5X that. Sheath need to be a leather one. Knife is VERY BEAUTIFULLY DONE !! VERY sharp. Fantastic Price. Received this beautiful message knife rather quickly. I love it. Feels great in my hand. It deserves a better sheath. Can't eat the price.